Today I want to share our current guest room that has been recently dolled up to show more of our current style. Most of the pieces in this room have been with us for some time but with a little paint and creativity, it all looks new! Affiliate links are provided for your convenience. You will not be charged extra for clicking here. This room was already pretty nice before this do-over but it just wasn't making my heart sing! So I thought about it and realized that the like new bedding that was in here wasn't the right color. I took that bedding off and saved it for the future then headed out for a shopping trip. I had made up my mind that spending would be minimal because, to be honest...I was feeling guilty about doing this at all since it wasn't a necessity. A quick stop at HomeGoods led me to this quilt and sham set that I knew would be perfect. The set was about $40 if I'm remembering correctly, and the quality is great! 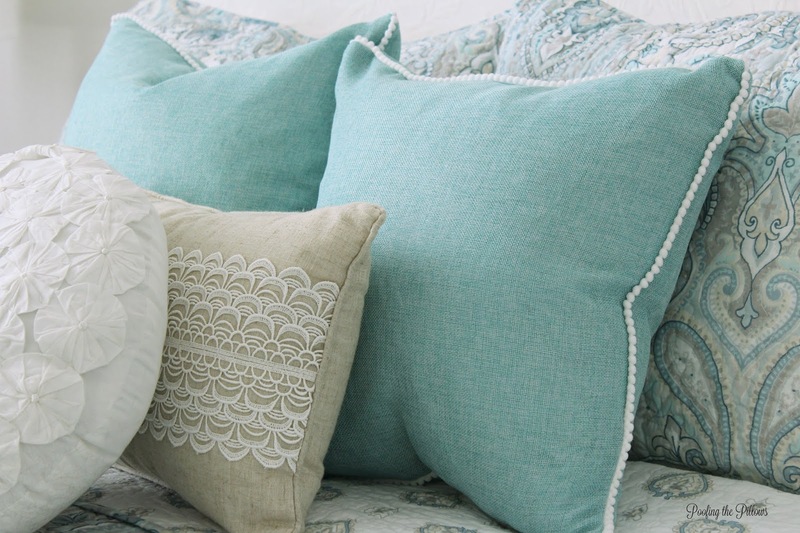 I also got those turquoise colored pillows in a set of two. Every room needs a nice chair and this circa 1987 chair came from my husband's mom. It rocks which is really nice for relaxing and who knows, maybe we will need a rocking chair in there one of these days. 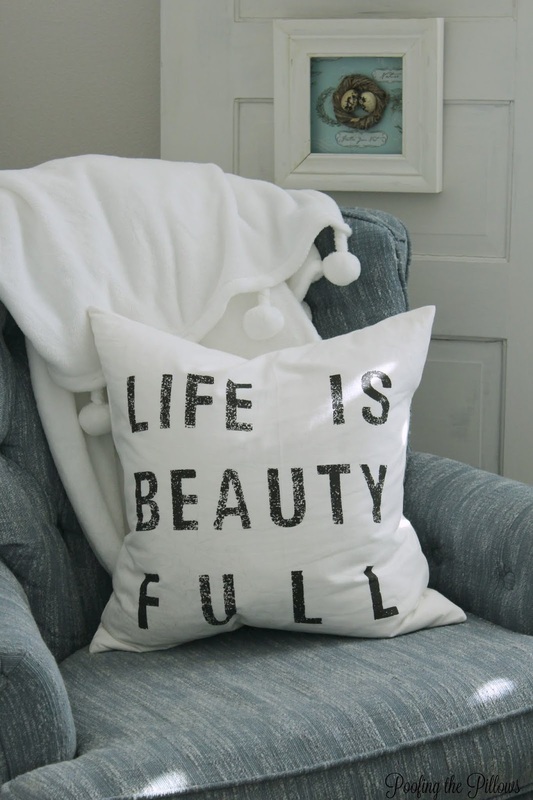 The Life is Beauty Full pillow has floated around our house but I believe this is its landing spot. It just seems perfect there. The ceiling in this room is 14' and we needed some height behind the chair. A door from my dad's prior home is just the thing to add character to the corner. I hung a coffee filter wreath and a small art piece that was a gift from my BFF. The dresser and mirror are got a quick coat of Annie Sloan Pure White chalk paint and lacquer. I'm no pro at painting furniture but this quality piece had yellowed over the years and now it looks great in the cottagey style room. We added more color to the room with art pieces that we already had and a few family pictures. The room didn't feel quite complete so I ordered a rug from Joss and Main which made it feel pulled together. On Instagram the other day, I was asked about the headboard. You all have seen this before because we made it at our last house. 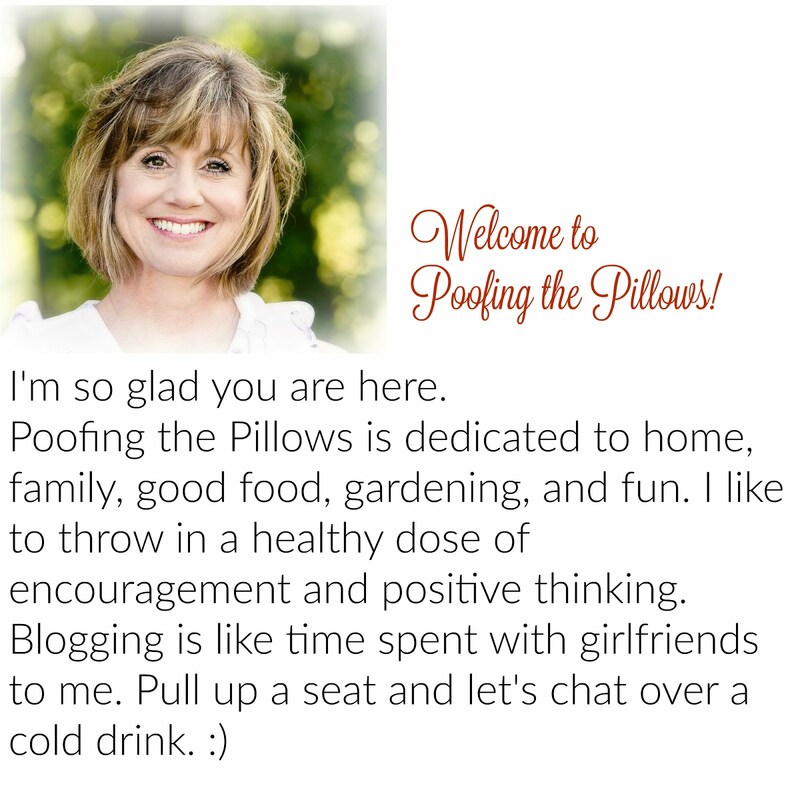 If you ever wonder about making your own padded headboard let me assure you - it's so easy! We cut plywood in the size and shape we needed. Wrapped the wood with foam. Then wrapped with batting. Last, we wrapped and stapled fabric (we actually used an old bedspread) just like you would a present. The headboard is hanging on the wall with D-rings. Easy peasy! It is lovely! I think any guest would be very happy there! Life IS Beautiful and so are you and this room!! That aqua makes my heart sing. So serene..great retreat for me when I come down, lol!! Oh such a beautiful room. Everything does look so new and fresh. I would love to be a guest there. Oh, I just adore that bedding!! two of which are under eaves. I need to get on it! What a cheery welcoming guest room! I like seeing things in rooms that have connections to the past. 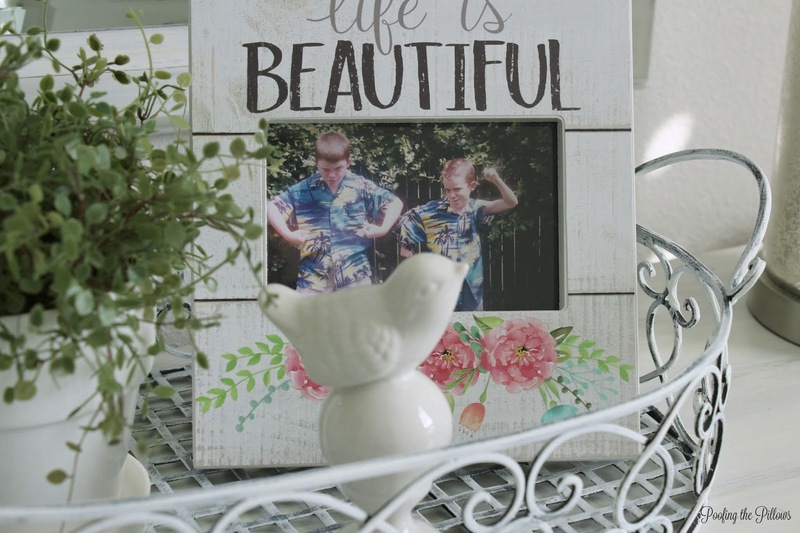 Your dad's door, the family photos, and the refinished dresser make the room feel like home. It really is pretty and matches the rest of your decor. The bedspread is just right! I have spent way more than I ever should have on bedding, but when you finally find the right one your heart sings each time you walk in the bedroom. I like the door in the background too. Very pretty! I love these soft colors and they could have a beachy feel to them too if you wanted to redecorate....again....later on! heehee! The headboard sure is a great idea. And I love the pillows on the bed. I'm getting in the mood to decorate but I need to do some serious cleaning first! Hugs! Stacey how pretty! Love all the light and fresh colors. You did a great job. My eye was immediately drawn to that pretty blue table with the wood top! I love the bedding too. It's always good to ask our guests what the room needs. I read somewhere to spend the night in your own guest room to see what's missing or if there's something that needs to change. I think you have it all covered though! It's beautiful! Stacey, how pretty! I love your colors and taste. You did a wonderful job. I love this pretty room you decorated. The bedding is so nice and I love the color scheme. Anyone would be happy to sleep in this room. The room is lovely...looks so peaceful and inviting. I'm sure any guests that come your way will delight in spending some time there. And what a bargain you got for $40!!! Wish there was a Home Goods near me. I want to do some redecorating and will need to do it on a budget. A most beautiful and welcoming room for your guests. Love the rug, the painted chest...oh love it all. It is always a good thing to have a great chair for your guests too...love that chair! Have a great day Stacey! Love this Stacey. So serene and peaceful. Your guests will love their stay in this gorgeous room. 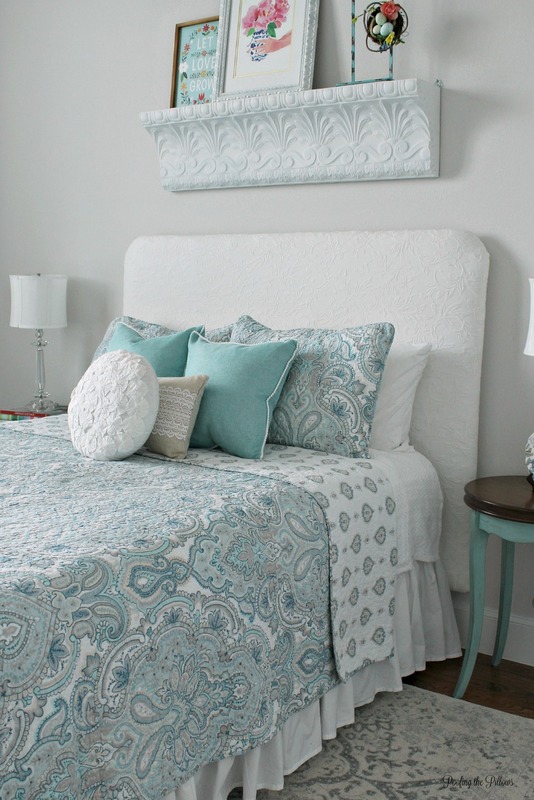 Stacey, the guest room is so pretty and any guest would absolutely love it. The bedding is perfect and your details add a great big welcome! Ohhhh sooooo pretty!!!! The bedding is gorgeous!! So pretty and serene. I am sure any guests would feel pampered and relaxed to stay in your guest room. Stacey this room is lovely. Good job on the dresser. Paint works miracles. Wonderful blues with the pillows and bedding. Great rug too. Your guests will be very relaxed. I know if i ever came to visit i would feel very welcomed, in a cozy room like this. This room is VERY pretty! I just love the new bedding. It all ties together beautifully. A room that I would love to be pampered in. Love the soft turquoise color. It's such a pretty room - great touches all around. Great job, Stacey! Looks so pretty. I love your taste. It is beautiful, Stacey! A guest would feel so welcome and cozy! Love it, Stacey! That bedding pattern looks the same as the placemats and napkins I had in my recent seascape beachcombing tablescape. I really like that pattern! Love those soothing colors throughout your home. It's super cute. The door, the headboard and that cute bedding. I love it. Your sister in law will have a restful night in this darling space. What a beautiful guest room, Stacy. I love the soft colors and the shelf over the bed. I love the beautiful soothing color Stacey! What a great deal on the bedding. I love Home Goods. I just bought a new sofa table there yesterday. Just saw it, and decided a change would be nice. :) Thanks for sharing with SYC. Stacey your quest bedroom is wonderful! 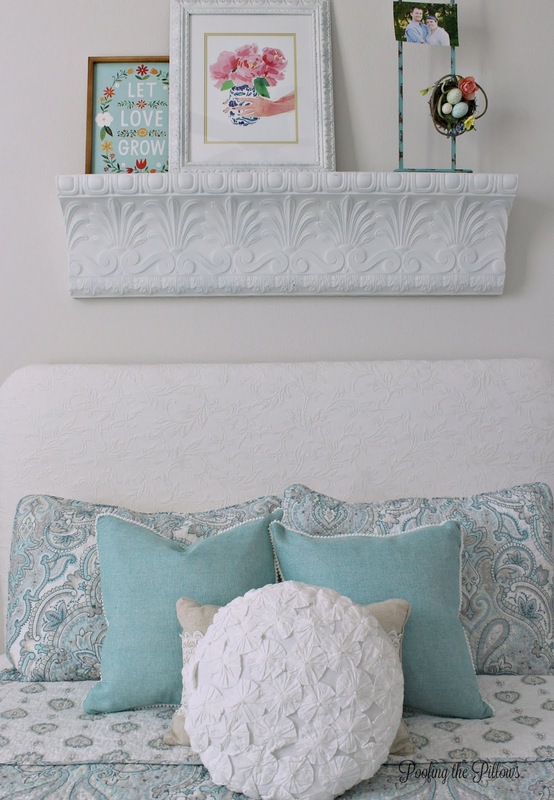 Love the textured fabric you used for the headboard, great job! It looks so soft and calming. I would be one of those guests who would never want to leave! Stacey that shelf on top of the bed is so pretty. It really adds a special note to the room. 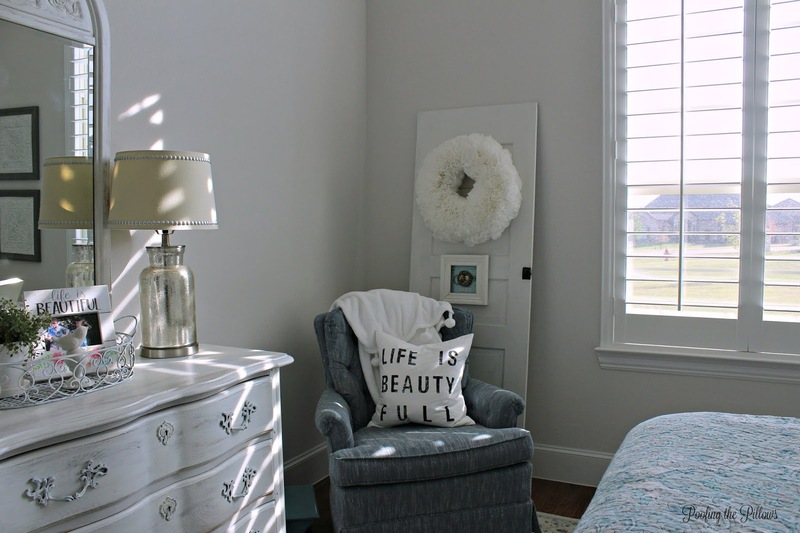 Stacey, your guest room looks so lovely and inviting! Thanks for sharing at Vintage Charm--pinned! Can you tell us the brand of bedding that is please? I want it so bad! Laurie, I hope you see this response! The bedding is Tahari Home brand. I did get it at HomeGoods but I Googled it and it pops up at lots of places. I hope you can find it. The quality is great and the colors are so pretty. I love how that all turned out Stacey! The colors couldn’t be more perfect for you and the fabrics are comfortable and welcoming. Luggage racks are handy- I added one to my guest room too. I like the old door- it adds a great design feature! The room is soothing, relaxing and lovely in every way!